This picture was taken at the exact moment I realized gold fever is a real thing. 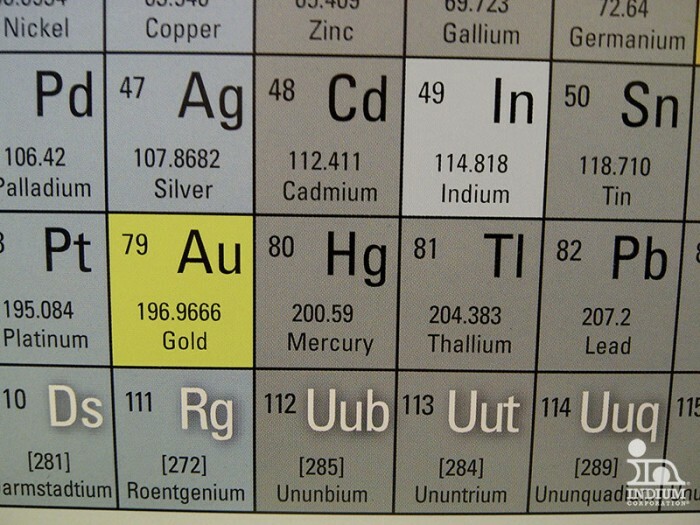 For some reason, I find the combination of gold and indium incredibly interesting. This shouldn’t come as a surprise; I caught gold fever panning for gold during a trip to Alaska, and “indium fever” is a pre-requisite for my job. Well, if it isn’t – it should be. In addition, not every combination of gold and indium is an alloy, these elements also form intermetallics. For information on all the combinations and resulting metallurgical structures, I recommend checking out this phase diagram and accompanying explanation. My interest does not end with the properties of the Au/In alloys and intermetallics, these combinations are sometimes aesthetically pleasing as well! Depending on the combination, these materials can have a hue to them. To some well-informed jewelers and metallurgists “blue gold” is known to be an interesting material, although it is very rarely produced due to a few factors. 1) Most Jewelers don’t have the right equipment and/or metallurgical background to process the material. 2) It is more like a gemstone than a metal in physical qualities, so it is difficult to work with. 3) For the slight hue, for most people the expense and difficulty are not worth the expense and effort. It is possible to cast the Au-In, and that’s probably your best bet. I wear a ring with Au/In cast into it – at times I wonder if the blue tint is even visible. Another hue that is possible is a rose color. The image below is 82%Au/18%In. Again, this hue is quite faint, but it is noticeable when compared to indium or most other colorless solders. Au/In alloys also find use in brazing applications. 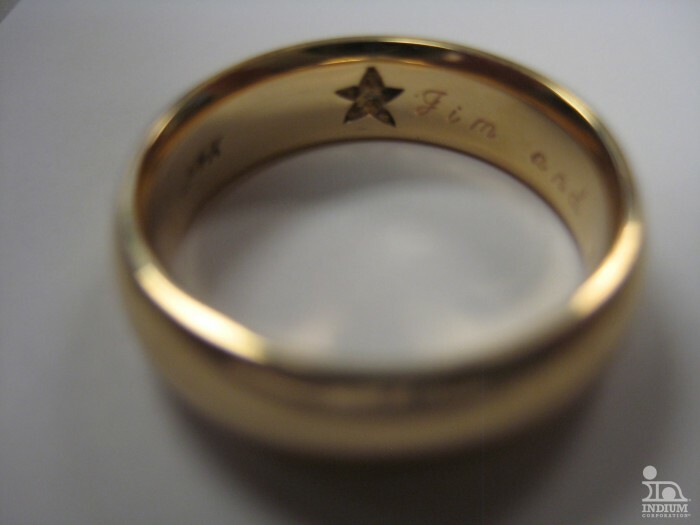 A gold-indium bond can be formed under 200°C, and will resist re-melt until temperatures over 400°C! Although this is obviously an expensive braze material due to the gold content, it is very interesting for applications requiring low processing temperatures, high strength, and high in-process temperature resistance. This alloy is well worth the cost for certain applications. Since we are discussing brazes, I should also mention a resource for anyone out there looking for more information than I can provide on the topic: Bernard Leavitt is a Product Specialist for High-Temperature Applications at Indium Corporation. (“High-Temperature” is relative to a solder company, this term includes low-temperature brazes.) By the way, Bernie has a blog and can be contacted directly for more braze information at bleavitt@indium.com. I have brought all this Au/In information up today for a good reason. In the past, gold-indium alloys have been quite brittle, which means they were difficult to form into parts, package, and ship without cracking. As long as I have been interested in these alloys, they always seemed like something I shouldn’t mention, because they were so difficult to manufacture. So, what has changed? Well, for most solder/braze suppliers nothing has changed, many companies have no desire in offering these unique alloys – and those who do face the same struggles we have in the past. Indium Corporation has recently made breakthroughs in processing gold-indium alloys, so I am no longer holding off discussing these materials with you. We offer an amazing 82%Au/18%In alloy in a variety of ribbon and preform sizes, and I hope you don’t hold off contacting me to discuss your next Au/In application.